As you browse the internet, online advertisers track nearly every site you visit, amassing a trove of information on your habits and preferences. When you visit a news site, they might see you're a fan of basketball, opera and mystery novels, and accordingly select ads tailored to your tastes. Advertisers use this information to create highly personalized experiences, but they typically don't know exactly who you are. They observe only your digital trail, not your identity itself, and so you might feel that you've retained a degree of anonymity. By looking at the set of web pages an individual has visited, we were able to pick out similar social media feeds, yielding a list of candidates who likely generated that web browsing history. In this manner, we can tie a person's real-world identity to the nearly complete set of links they have visited, including links that were never posted on any social media site. In 2006, Netflix ran a contest to improve the quality of its movie recommendations. They released an anonymized dataset of people's movie ratings, and offered $1 million to the team that could improve their recommendation algorithm by 10 percent. Computer scientists Arvind Narayanan and Vitaly Shmatikov noticed that the movies people watched were very distinctive, and most people in the dataset were uniquely identifiable based on a small subset of their movies. In other words, based on Netflix movie choices and IMDB reviews, the researchers were able to determine who those Netflix users actually were. With the rise of social media, more and more people are sharing information that seems innocuous, but actually reveals a lot of personal information. A study led by Michal Kosinski at the University of Cambridge used Facebook likes to predict people's sexual orientation, political views and personality traits. Another team, led by Gilbert Wondracek at Vienna University of Technology, built a "deanonymization machine" that figured out which groups people were part of on the social network Xing, and used that to figure out who they were – since the groups you are part of are often enough to uniquely identify you. Even if you stop using the internet, companies can still collect data on you. If several of your friends upload their phone contacts to Facebook, and your number is in all of their contact lists, then Facebook can make predictions about you, even if you don't use their service. The best way to defend against deanonymizing algorithms like ours is to limit the set of people who have access to your anonymous browsing data. 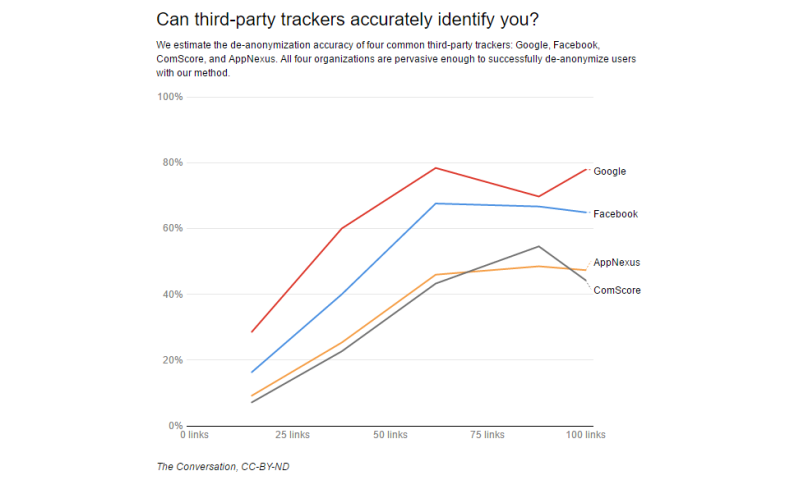 Browser extensions like Ghostery block third-party trackers. That means that, even though the company whose website you're visiting will know that you're visiting them, the advertising companies that show ads on their page won't be able to gather your browsing data and aggregate it across multiple sites. However, there is very little you can do to protect yourself against deanonymization attacks in general, and perhaps the best course of action is to adjust one's expectations. Nothing is private in this digital age.